Welcome to “Easthaven”, a town that thrives on collecting and bartering goods, you are a traveller that has arrived to make something of your family name. During your stay at “Easthaven” you hear the fable of the long lost treasure that lays on the 100th floor. How far will you venture into the deep dark caverns that lay underneath this city? How hard will you push yourself to make something of your families title? 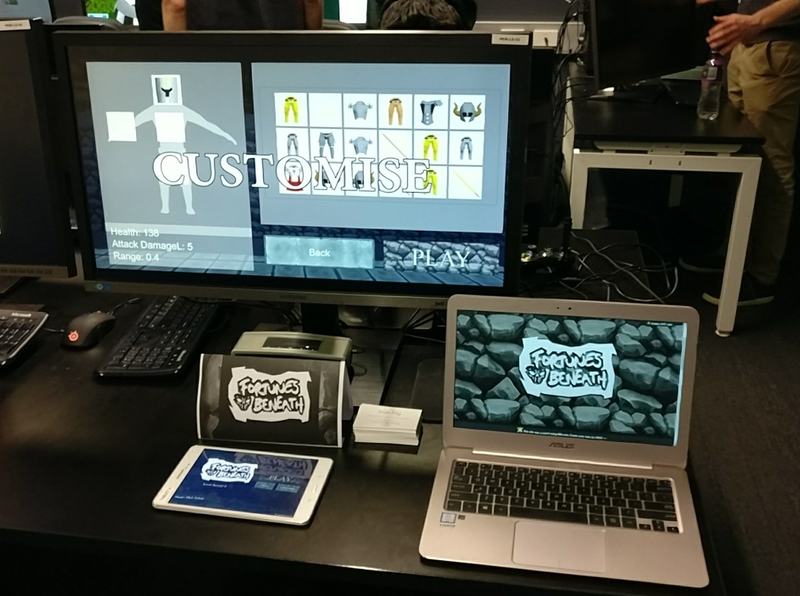 Yesterday was SAE Perth's student showcase and we had the opportunity to show off our game that we've been working on all trimester. This is my 3rd ever showcase and just like all the other times I had to get work on that day that I can't take off. So a lot of things were rushed and a lot of things had to be done before. Stuff like printing posters, printing my business cards, which was a learning experience. Note to self, do not get business cards printed a day before showcase because it'll cost me $60 for 50. But overall the night was fun and we managed to get people to play test and break our game but for most parts the game was working and the night went well. Going through what the process was when I was designing the landing page. The work that I have produced for this game over the previous week. Play testing and cutting scope to reach the end goal.